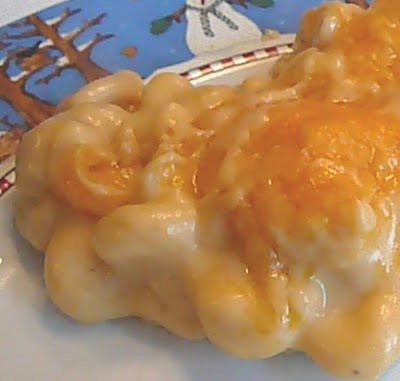 A few weeks ago The Democrat and Chronicle ran the recipe for macaroni and cheese from a local restaurant, the Dinosaur Bar-B-Que. I took one look at it and said "no way." It had loads and loads and cheese -- four kinds of them in all. It looked like a heart attack waiting to happen. But the recipe kept calling my name. 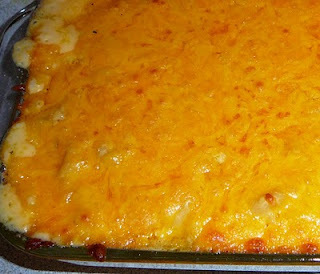 First, it had been featured on Good Morning America as Sam Champion's favorite macaroni and cheese. And it came from the Dinosaur Bar-B-Que, which is a very popular restaurant here (there are also locations in Syracuse and New York City). I've only been there once or twice, but I remember the food being excellent and the atmosphere fun (it often has live music, mostly blues). I've also had some of their catered food and it's been heads and shoulders above most catered food I've had. The recipe also intrigued me from a culinary perspective. It had onions and green pepper in it, which are ordinarily a problem for a couple of my household's eaters. But in this recipe, the onions and green peppers were pureed into the sauce. It's not a technique I've used a lot, and I wondered how it would taste. I was also curious to see how that would fly with my husband and son. Was pureeing an option if I wanted to get some flavors into a dish without having it rejected at a glance? The answer is yes. We all thought the recipe was divine. 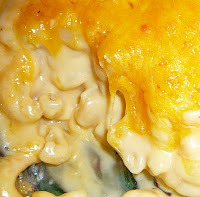 It was positively decadent -- super rich and ultra cheesy, without the distractions of bits of veggies floating around or extraneous bread crumbs on top. I won't make this often because it is a nutritional disaster, but I'll probably make it again, most likely for guests. I made half of the recipe that ran in the newspaper, and it was plenty for the four of us. (Two of us ate it as a main dish, and two of us had it as a side dish). Because it's so rich, I would suggest serving it as a side dish -- there would be plenty for six people. 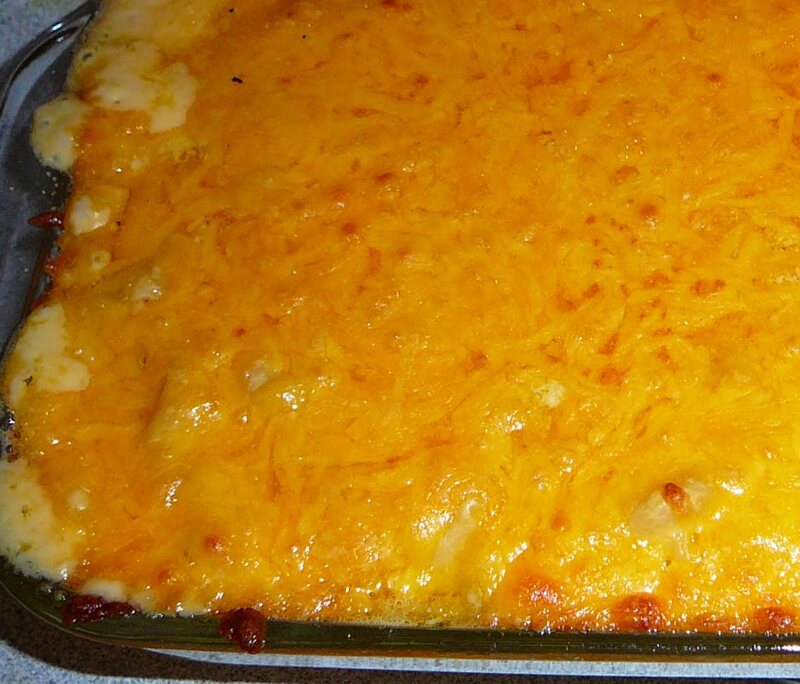 If you wanted it not to be quite so rich, you probably could increase the amount of macaroni in it. Heat oil in a large pot. Add onions and peppers; cook until onions are translucent. Add garlic and cook until fragrant. Stir in flour. Add water and half-and-half. Bring to a boil. Reduce heat to a simmer and cook for 10 minutes. Using an immersion blender, puree this mixture until it is smooth (if using a regular blender, work in batches, filling the pitcher only half-full, since the liquid will be hot). Slowly add cheeses to warm pureed mixture, making sure all cheese is melted before adding more. (If the cheese isn't melting, return the pot to low heat and stir constantly.) Once cheese is completely melted, add salt, lemon pepper, sugar, mustard, vinegar and Tabasco. Stir to combine. Cook dried elbow macaroni in boiling water, according to manufacturer's instructions. Cook until al dente, not completely soft. Combine hot, cooked pasta and sauce in the large pot; stir well to combine. Pour entire mixture into a greased 11-inch-by-7-inch pan (a 9 by 9 probably would work as well). Top with half of the shredded cheddar cheese and half of the Pecorino Romano cheese. Place under broiler until top is golden brown and bubbling. (Because I was cooking something else at 450 degrees, I cooked it at that temperature, and it was fine.) Serve immediately. Four kinds of cheese? Count me in!! Very cheesey! I will have to make this for my five year old. Of course it will have to be put in the freezer in small portions. YIKES, as for me, lots'o'calories. My husband goes there a lot for lunch. He loves the Portobello sandwich there. Ohh, I love mac and cheese. I'm glad you went for it. I'll have to try this recipe sometime. It certainly does look cheesy! THanks fro sharing with Presto Pasta Nights. Just my style of mac! You just can't try to cut back on a big dish of cheesy goodness. Looks like a great recipe! Oh boy, thanks a ton for posting that recipe! That is right up my clogged artery! I have no access for good mac and cheese other than what I make myself....the restaurants around here are pretty corporate. Mac and Cheese is my favorite!! Plus to puree the peppers, I might get my daughter to eat them without knowing. I am going to give this a try on a day when I am not sticking to my diet! Wow this sounds deadly! I love mac and cheese so I'm saving this. The idea of pureeing the onion & green pepper into the sauce sounds delicious. Thanks all for your comments. If you make it, please don't blame me for your heart attack. 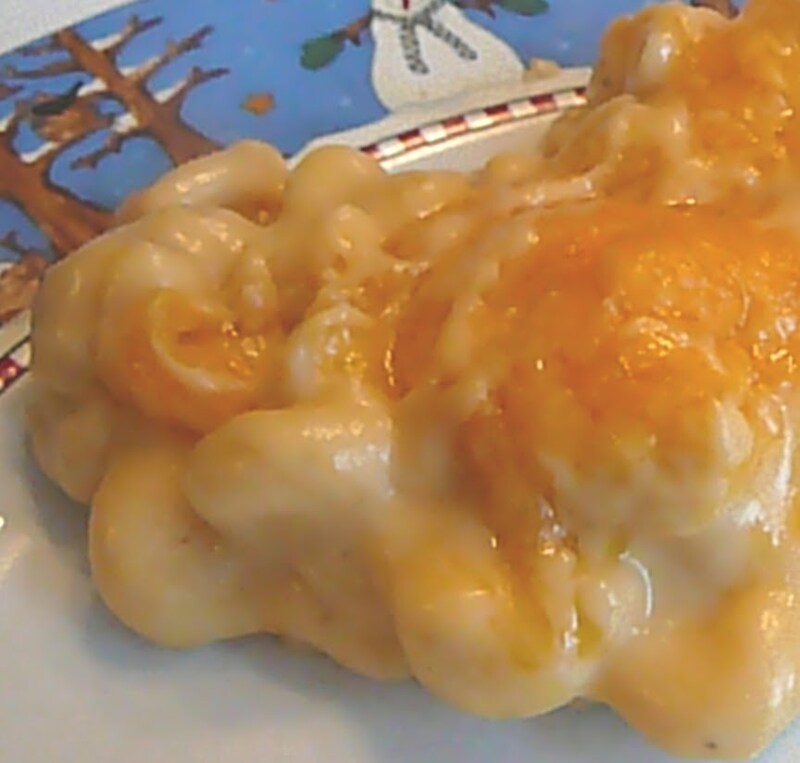 I wanted to mention that it reheated welll -- the cheese didn't separate and get gloppy, like some recipes -- but the macaroni did get pretty soft, and for some reason the green pepper flavor seemed more pronounced. Lori, I can't imagine going to the Dinosaur and ordering a Portobello sandwich! It's either ribs or pulled pork for me. I've made this recipe. It is the most decadent, rich, and over-indulgent food I think I've ever eaten--other than chocolate--come-on! I made the whole recipe (not halved like you suggest-which is much more a rational thing to do) and I had plenty of left-overs. You don't notice the veggies once they're pureed, just the flavor, which is an excellent enhancement. And, by the way, thanks, too, for the recipe, as I seemed to have misplaced mine and need to make it for a returned-home-from-college daughter who is a dinosaur maniac. Made this recipe this weekend. WOW! Soooo good. Could have halved the the recipe. But this is right on. Nice job! I was just at Dinosaur this past week and I was craving their mac and cheese. This recipe looks great. Thanks. Does anyone know what the seasoning is that they sprinkle on top? I think it is a mixture with paprika or cayenne in it. Khat, sorry I don't know what they sprinkle on top. Maybe paprika. What they sprinkle on top is the dinosaur Cajun foreplay spice rub! I work there, you can get it at any dinosaur BBQ for 3.99, some WEGMANS and also on the website. I put that Cajun foreplay in EVERYTHING. eggs, quiche, mayo, meatloaf, burgers, you name it. It is fantastic!! Breakfast with a guest blogger: my 13-year-old!